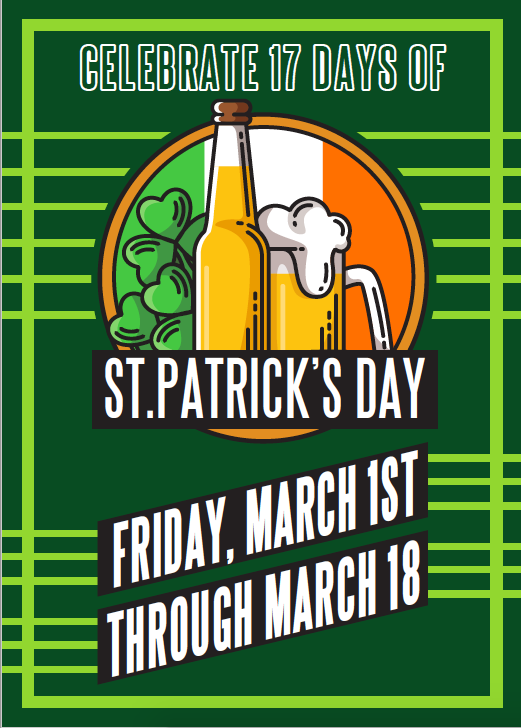 17 Days of Saint Patrick! Saturday March 2 - Mardi Gras Masquerade! Monday March 4 - All Day Breakfast! Buy a Smithwicks and keep your glass! Purchase a Guinness Stout or Guinness Blonde and get your pint custom engraved! Grab a pint of Flying Dog's Signature Irish Red Ale - Lucky SOB and keeo your glass! Purchase a Jameson bottle and get a custom message engraved. Basket of Prizes to first guest in Slainte!